To Lola Laureano’s grandfather, the objects in his rear view mirror appeared blurry. His legs felt heavy on the gas pedal. Street signs seemed to swirl, as his head grew dizzy. A feeling of confusion set in. Her grandfather, an immigrant from Mexico, spoke only Spanish. However, at the Cook County Health System clinic where he had blood drawn, the phlebotomist did not use an interpreter or speak his language. Laureano’s grandfather is one of a growing number of Hispanic elderly reaching out for social and healthcare services. However, deficient government funding is creating tension between this expanding population’s needs and what the country’s social safety net can offer. One increasingly familiar manifestation is found in the health care setting. According to a Health Affairs report, cases of language barriers compromising patient safety are becomingly commonplace in the United States. Delayed diagnoses, overdoses, and even procedures performed on the wrong patient are occurring as result of inadequate language services, said Dr. Glenn Flores, an author of the report and Distinguished Chair of Health Policy Research at the Medica Research Institute. The cause is a perfect storm of demographic and policy changes. There has been a three-tiered population shift in recent years. First, the elderly population in the United States has multiplied. Second, the elderly immigrant population in the United States has also flourished. And, on top of those, the Hispanic elderly immigrant population is now surging. Numbers tell the story well. According to the Migration Policy Institute, the total U.S. elderly immigrant population nearly doubled in only 20 years, from 2.7 million to almost 5 million. The major contributors of this swell — elderly Hispanics — are projected to grow from 3.6 million to a total of 21.5 million by 2060. Altogether, they will make up 22 percent of the elderly U.S. population, according to the U.S. Department of Health and Human Services. Accordingly, older Latinos now represent the fastest-growing population currently at or near retirement, according to An Aging Nation: The Older Population in the United States,” a report issued by the U.S. Census Bureau in 2014. Two features of the Hispanic senior population make them particularly vulnerable — the likelihood that they speak limited English, a classification known as (LEP) and their doubled risk of chronic conditions, according to the National Hispanic Council on Aging. Another compounding factor is financial hardship, which is pervasive among Hispanic seniors, with over 70 percent being on the verge of poverty, according to a report by the Economic Policy Institute. This makes private health care insurance out of the question for most Latino seniors. “Most of the families we work with have never even heard of long-term insurance,” said Tatiana Sanjines, director of the adult wellness center at Casa Central, a social service organization in Chicago. But the Affordable Care Act, including changes in Medicaid eligibility, catalyzed historic insurance coverage gains among those normally alienated from healthcare, according to a New York Times analysis. Immigrants had the sharpest rise in coverage rates of any population, with Hispanics accounting for nearly a third of the increase in all adults. As a result, there is now a booming demographic of Hispanic elderly pouring into both social service and health care systems. As the caseload surges, experts are worried that government funds are drying up. Vital needs, like interpretation services, are not being met, said Dr. Leighton Ku, one of the Health Affairs report’s authors and Director for the Center for Health Policy Research at George Washington University. Medicaid and Medicare provide much of the health care coverage for Hispanic seniors. Often low-income, they qualify for Medicaid, and over age 65 or disabled, they also qualify for Medicaid, so many Hispanic seniors are “dual eligible,” enrolled in Medicaid and Medicare at the same time. Working in tandem, both programs could help balance service costs for beneficiaries. In reality, because neither program holds full payment responsibility, “dual eligibles” are often entangled in complicated health care bureaucracies, forced to advocate for themselves and navigate the two programs’ divergent copays, deductibles, premiums, and requirements. Moreover, according to the National Hispanic Council on Aging, scarcely any Hispanic seniors have access to a computer or stable transportation to secure accurate information or timely assistance. “Everyday, we have a participant come in with a little piece of paper which says ‘they told me this was my last notice’ or ‘I didn’t renew my application for this’ or ‘I don’t understand this,’” said Illeana Gomez, Deputy Director of Senior and Community Services at Casa Central, referring to confusion from multiple government programs. 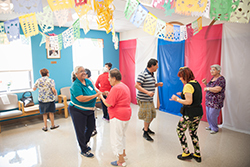 In 2013, Illinois launched the Medicare-Medicaid alignment initiative to ease the complexity and provide a “more coordinated, person-centered care experience.” But insufficient language access brings any meaningful reform for Hispanic seniors to a standstill —interpretation services are rarely covered by either program in Illinois, said Ku. This ostensible gap between requirements and funding left Hispanic senior Angelica Saavanger in a precarious middle ground, where there was high potential for a dangerous mishandling of treatment. After leaving the hospital following surgery, Saavanger received home care services through a county care plan. However, none of the caregivers spoke Spanish, her primary language. “One of us always had to be there to translate,” said Saavanger’s granddaughter. The single instance when her family was not present, they arrived home to find one of the provider nurses yelling. She was urging the grandmother to sign papers stating she had visited — on days when she never had. Saavanger is not alone. Nearly half of limited English proficient patients receive no interpreter, said Flores. Yet when about 40 percent of Hispanics aged 65 and older speak English, according to the Pew Research Center, bilingual services become absolutely paramount. “One of the things federal rules basically say is you’re supposed to provide [language access] services. But they don’t exactly say how you pay for it,” said Ku. As a result, hospitals and healthcare organizations are legally required to provide these programs without reimbursement — even as demand soars. The importance of language access for safe, high-quality care is well documented and recognized within the medical community, said Flores. Thus, when the Affordable Care Act rolled out, said Ku, billions of extra dollars were apportioned to community health centers, facilities that frequently provide bilingual services because of the profile of their average client. “Everyone from the doctors down to the people at the front desk can often provide services in a multitude of languages,” said Ku. For Latino seniors, these community health centers are critical linchpins in the health care safety net, said Ku. “Unfortunately, after fiscal year 2017, some of the additional federal money [for community health centers] runs out and no one is quite sure how it’s going to get funded again,” said Ku. Anticipated federal cutbacks will trickle down, threatening to strangle the resources of community health centers in traditional immigrant cities. In Chicago, budget cuts make the problem particularly acute. According to the city of Chicago website, its neighborhood-based health clinics assist underserved populations, primarily “the uninsured, low income, Medicaid recipients, and ethnic minorities,” all descriptors of the Hispanic elderly population. But a public information document released by the Chicago Department of Family and Support Services (DFSS) on May 2 reveals a system spilling over capacity. “Many of the Chicago Area Agency on Aging’s programs have experienced growth in the number of participants as well as the number of challenging cases that require more time and care and this is projected to continue into 2017,” the report states. For Susan Vargas, manager of Satellite Senior Center in Pilsen, funding cuts couldn’t come at a worse time. In line with the demographic upheaval, Vargas said the senior center’s caseload increased to more than 2400 Latino seniors last year, yet was facilitated by only 3 full-time equivalents. Chicago is likely working hard to provide the services and the interpreters to help out, said Ku. But now, as the Illinois budget impasse approaches its one-year anniversary on July 1, there is growing tension between the aging immigrant population’s expanding needs and what the city and state can provide. Spanish-speaking representatives are still available through a Senior Help Line (SHL), as is programming serving older adults “of many different nationalities and races,” according to Veronica L. Vera, Director of Communications for the Illinois Department on Aging. But the budget crisis has stripped away the quality and availability of many of these programs, said Vargas. Because they typically fall in the very low-income range, Hispanic seniors tend to depend on these services more than most, said Vargas. Nonetheless, an unprecedented number of senior programs is under threat: The 6.5 million meals delivered every weekday to homebound elderly. The thousands of home care workers who help them dress, bathe, and cook. The transportation services to reach doctors and pick up prescriptions. And even the protective services for reporting abuse. All are in jeopardy because of the budget crisis, according to the Fiscal Policy Center at Voices of Illinois Children. Compounding the impact of these cuts on Latino elderly are the changing dynamics within Hispanic families, said Mayra Quiñones, director of Home Care Services at Casa Central. Yet with the complex health care system and few bilingual services, access to a caregiver becomes vital. However, not all support systems for Latino older adults are collapsing. Ironically, the DFSS report projecting service cuts also presents a ripple of hope. The city “continues to aggressively pursue alternative resources,” the report states. Indeed, the city’s collaboration with the not-for-profit sector has been a lifeline to senior Hispanics – especially in caregiving services, added Gomez at Casa Central. Casa Central, a public nonprofit and the largest Hispanic social service agency in Chicago, accepts referrals from the the Illinois Department on Aging. It now serves more than 1,000 of Chicago’s Latino older adults through its senior programs, including an adult wellness center and home care services, said Quiñones. But Casa’s home care aides end up doing much more than cleaning, cooking and bathing, said Gomez. 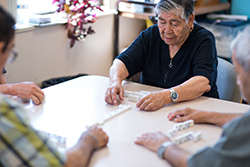 It appears that government partnerships with organizations like Casa Central have not only helped bridge the funding gap for Hispanic seniors, but also the generational divide.